I recently drove the Tiguan on a short journey through the Lower Saxony region of Germany, and I was quite impressed with the entire package. Like the Polo and Vento, the Tiguan isn't flashy but possesses high levels of sophistication in its design. 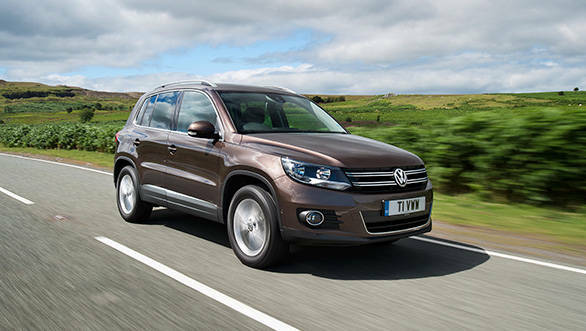 The clean lines and simplicity of the overall design gives a good upmarket feel to the Tiguan. Having said that, the Tiguan isn't a very noticeable SUV in a crowd, and in Europe, especially amid all the Audis and BMWs and Mercs, it's hard to spot the Tiguan. This is despite, I think, Lower Saxony having the highest concentration of Tiguans in the world. The stance is typical SUV, tall and wide with good ground clearance, but the lack of foreboding muscle and loud styling makes it too discreet. The Tiguan is 4.43m long, 1.8m wide and 1.7m tall. The wheelbase at 2.60m is around 50mm shorter than the Jetta but has a wider track. Ground clearance is a 175mm, which is comfortably high for the state of our roads. The high quality level continues to be seen inside the Tiguan where the dashboard layout and styling has very similar tones to what is visible in the Polo. Familiar instrument console, steering wheel, switches and controls make this cabin a cozy place to be in. The controls have the same wonderfully tactile feel that you experience in the Jetta and the fit finish as well as material quality is top-notch. The vertically stacked air vents flanking the centre console screen is the only bit that is unique in this cabin. So you get eight vents in the front area making a total of 10 vents inside the cabin, if you include the two for the rear passengers. 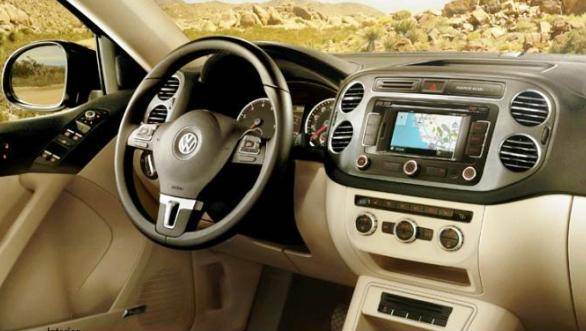 The Tiguan offers a spacious cabin, good for five passengers only. The driver seat offers good all round visibility, though in Indian conditions where traffic is less predictable compared to Europe the thick A-pillar can be obtrusive. The rest of the passengers get good leg and knee room, and the ones seated at the rear will find enough shoulder and head space too. 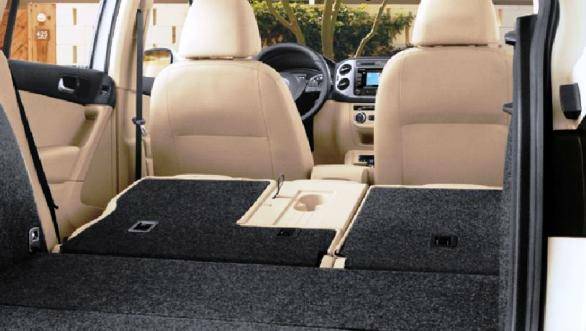 A flat floor and non-intrusive aircon vent enhance comfort for the passenger who sits in the middle. The boot is massive with 670 litres of cargo room that can be extended to 1,550 litres by folding down the 40:60 (or more like 70:30) split seats. There are several powertrain options offered globally, but the ones that make the most sense for India are the engines that are already offered here in the Jetta or Passat or Yeti. That means Volkswagen could look at offering both the 1.4TSI petrol - there is even a 2.0-litre TSI but would be prohibitively expensive - and what could easily be the most popular choice if offered in India, the 2.0-litre diesel in three states of tune, a 110PS, 140PS and a 170PS. I drove the 140PS Bluemotion diesel and it felt sufficiently smooth and refined. Don't expect this engine to pack a punch though; it's got 320Nm of torque so drivability is good, but with just 140PS of max power, it's not a performance-packed crossover. Nonetheless, it's a reasonably responsive engine with a wide powerband, and driving it in crowded urban areas should not be a strained affair. This engine, however, is at its best cruising over traffic-free highways keeping the engine ticking over effortlessly at low revs. It also pulls cleanly from low revs, and on the autobahn, I easily achieved a top speed of around 180kmph without the powerband tapering off. Badge of a Bluemotion vehicle means the emphasis is more on fuel efficiency than performance. In European cycles, Volkswagen claims a combined efficiency of around 20kmpl, which is a mix of both urban and highway driving. Indian conditions, however, will show a lower number as our traffic can be a lot more erratic. I doubt Volkswagen would offer the 6-speed manual transmission in the Indian market, and the automatic 7-speed DSG would be the obvious choice. It has a manual mode with a sequential shift actuated by using the gear, the lever but no paddle shifters. Its ratios are matched to the torque curve to offer a smooth and consistent drive feel, but it isn't terribly quick to shift either up or down. The transmission offers a sport mode and that changes the shift points, which improves performance but isn't something you really need in a SUV such as this. The Tiguan does not have anything sharp in its repertoire, the handling is comfortable and this isn't a dynamically inclined SUV. But then again, it was never intended to carve corners, so it's got a fair bit of body roll, despite anti-roll bars at both ends; pitch though is tightly controlled thanks to a stiff suspension. In Germany, the suspension felt a bit on the stiffer side of things so my estimate would be that in India it could get a bit crashy. Nonetheless, the Tiguan munches miles comfortably and feels solidly composed at speed. The steering has electric power assist and is well-weighted. It's neither too light nor too heavy, but the ratio is not variable, so the effort required to turn it is consistent at all speeds. What it has is precision and a positive feel, both well-appreciated traits for something that could largely be used in just urban areas. There are two options to the drivetrain, there is a front wheel drive as well as an all wheel drive option available globally. The front wheel drive is only available with the manual transmission, so I guess that may never make its way here, though it is definitely more fuel efficient. The automatic is combined to an all wheel drivetrain, which gives it more traction when traveling around corners. There are several trim levels offered internationally with varying engine, transmission, drivetrain and features. On that last aspect, this is a well-equipped SUV with all that you would need in terms of creature comforts. Frills could be added to enhance the visual relief like in the R-Line variant as well as improve comfort. Basically, though, what the Tiguan boils down to is no nonsense everyday SUV. It's not going to receive glowing recommendations but will nonetheless go about its job effortlessly. The trick would be its pricing. If Volkswagen does intend to offer the Tiguan in India then, as I mentioned earlier, assembling it here and pricing it right could make it a very attractive vehicle. It makes a strong case for itself since the only other option available in the Indian market at a similar price point is the Mahindra XUV, not the best option there is but the only one for now. There are still a lot of families and individuals looking for a bit more sophistication, and the Tiguan could be just what they and Volkswagen both need.